The unique shape of the 1,500-foot Picacho Peak has been used as a landmark by travelers since prehistoric times. One of the first recordings was in the 1700’s by the Anza Expedition as it passed through the area. In 1848, the Mormon Battalion constructed a wagon road through Picacho Pass. The forty-niners on their way to California used this road. In the late 1850’s the Butterfield Overland Stage was carrying passengers through this area. Picacho Peak’s most noted historic event occurred on April 15, 1862, when Confederate and Union scouting parties met in the Battle of Picacho Pass during the Civil War. This was the largest Civil War clash to take place in Arizona. Picacho Peak is not a volcanic cone, but is part of a volcanic flow that has been partially eroded away. It has long been known for its spring display of wildflowers. If rains come at the right times in the winter, the spring will bring an explosion of gold to the bajadas of the mountain that appear as a tapestry of color. The wildflowers are predominantly Mexican Gold Poppies. 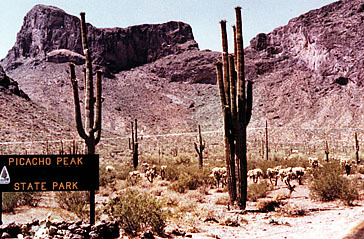 The Picacho Peak area was identified and included in the 1958 State Parks Board plan for potential acquisition as a State Park. This area of unique geological significance, outstanding and varied desert growth, and historical importance easily met the criteria for a State Park. During 1961, petitions to make this site a state park were received from the Coolidge City Council, Eloy Business and Professional Women’s Club, Eloy Women’s Club, Common Council of Eloy, Town Council of Florence, Oracle School District Board and the Pinal County Board of Supervisors. Late in 1962, State Park’s staff initiated a feasibility report on this proposed park. In March 1963, the Parks Board adopted the feasibility study and authorized Director McCarthy to begin negotiations for the acquisition of section 15 from the Bureau of Land Management (BLM). The feasibility study identified the primary purpose as protection of the resource with adequate land to develop compatible public use facilities. An interpretive program based on the unique geological and botanical significance coupled with the regional historical significance was envisioned for the park. The Park’s staff was working with the Transportation Department on the site as early as 1963 to ensure adequate access would be provided to the proposed park when the interstate highway was constructed. 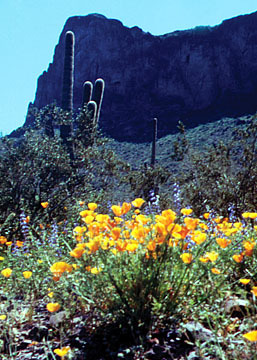 With strong local support for the Park, the Legislature in Chapter 73, Laws 1965, authorized the creation of Picacho Peak State Park and appropriated funds for the acquisition of 640 acres of land (Section 15) at the site. On April 26, 1966, the agency acquired its first 640 acres through the Recreation and Public Purposes process for $2.50 per acre. Development plans were quickly completed and Jon Clow, Park Manager, initiated construction on the first park facilities and interior roads and parking areas. The State Park officially opened to the public on Memorial Day, May 30, 1968. The Civil War skirmish near Picacho Peak was commemorated at the opening day festivities by honoring the known dead and wounded from that action. The legislature passed House Bill 217 that was signed by Governor Jack Williams and became Chapter 157, Laws 1970. This legislation authorized the purchase of an additional 2,760 acres of land from the Bureau of Land Management under the Recreation and Public Purposes Act for inclusion in the Park. 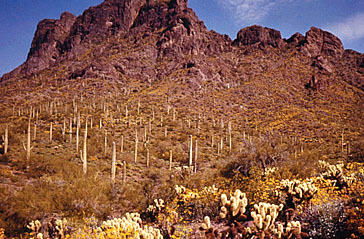 During the mid 1970s, legislation was pass that provided for land exchanges of private parcels around Picacho Peak for State trust lands. The Parks Board leased one of these exchange parcels located in Section 10 adjacent to major park developments from the State Land Department. This parcel provided an additional 258 acres to the Park when it was leased on August 1, 1981. In the 1990’s, two parcels were purchased and added to the Park for a total acreage of 3,747.